Viewer discretion is advised. This is a series of literature posted as a sci fi horror thriller that may have some gore that is not recommended for those of certain ages. If you are younger than 17, it is not recommended that you read this. Mannequin Mask and it's company does not condone any actions or words that are done outside of this novel series. 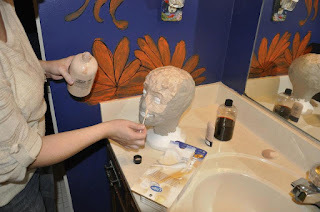 When creating the book firstly, Mannequin Mask came as a recurring nightmare back in middle school. After having the dream and on the brink of going insane (not seriously), but growing tired of waking up in a cold sweat and the urge to scream; I decided to write down the dream in the hopes that when on paper, it would leave my mind. Once written, the story grew and grew over the years and soon became a novel. The novel that I had created sat on a shelf of mine for years until I started going to college for film directing and producing. While in a script writing course, I was short of ideas for the start of a project, so I came across my old novel and began writing it in script form. From there, it was turned into a short film, and then this blog series. During the time of filming; a plethora of opportunity presented itself to me and my peers as we set out on this journey.